If you're anything like me you have always waited till the last minute to shop! When it comes to your significant other or children you probably already know what they want or have an idea of what to get them. For me, shopping for my parents has always been the hardest! It seems like they have everything they already want or need and nothing I can afford will make a huge impact in their life. I wish I could buy them a cruise or a vacation but the likely hood is rather that they will be helping to take us some where haha. Sooo with that being said I put together a small little list and a few ideas of things to get the PARENTS in your life! Electronics: that make their life easier! My in laws absolutely love their "Alexa" Echo. It's so fun visiting because the kids can request songs and dance in the living room. Can't wait to say "Alexa play Christmas music" come Thanksgiving at their house this year. Chatbooks: A great idea for grandparents! Most people don't print pictures anymore and rely on Facebook to see their family. Having a tangible book for the coffee table or somewhere in their home to look back at see pictures of their family and grandkids is such a fun idea and something they will keep forever! Journal or Book: another great idea for a grandparent! My mom got me "my quotable kid" and it's hilarious to read the things the kids have said over the years as they start talking more and developing a unique personality. This would be fun to fill out together when you are visiting them! Personalized ANYTHING: having a coffee mug, wine glass, pillow case, cutting board or anything for that matter, personalized is such a fun and genuine gift. It can be something really small too and they will appreciate the time it took to get it custom for them. You can have this done online or at the mall! Digital photoframe: If your parents like to travel it's a great idea to get all of their photos uploaded to a digital photo frame so they can constantly have their photos on a slide show and whenever they enter a room they can sit and watch. You can always add photos or change the photos on the slide too! My grandparents love having this in their home and it's fun to see where they have traveled. Date night gift box: This is one of the most recommended gifts I got when I asked on Instagram what people would get their parents. This is such a great idea to get your parents a little night out on you. 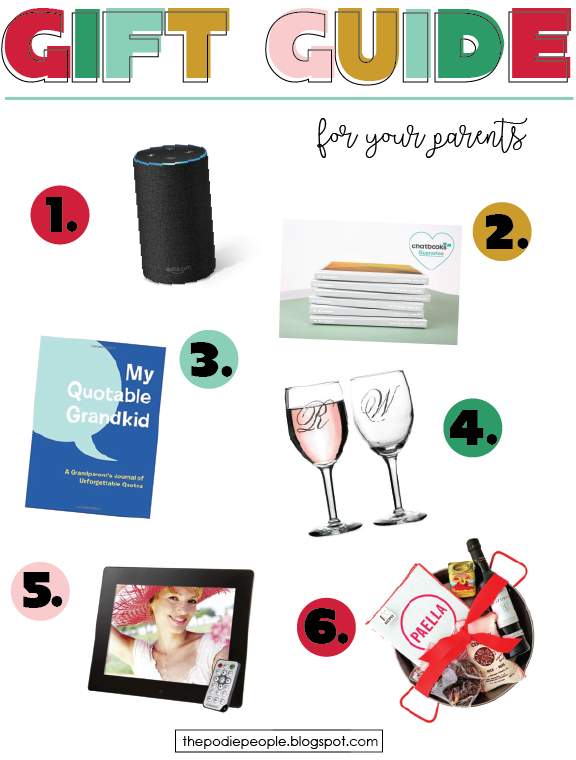 You can include snacks and tickets to a movie, a bottle of wine and gift card to their favorite restaurant or maybe even a new board game to play at home. Depending on what your parents like, make it personal for them! It's a really affordable way to show them that you care and wanted to get them something special for all they do for you. Service: not something I can add a photo of but one of the most important gifts there is. Our parents always help us out whenever we need it and we are so grateful for them watching our boys, feeding us dinner and giving us a place to hang out when we need to get out of the house. We love spending time with them and so helping whenever we can goes a long way. Offer to put lights up on their house, mow the lawn, make dinner for them one night or anything else! Dylan helps his dad in his lawn most weekends and we always have Sunday dinner with them. My parents are a lot busier and so I like to offer to clean their house or take my sister places if they are working.